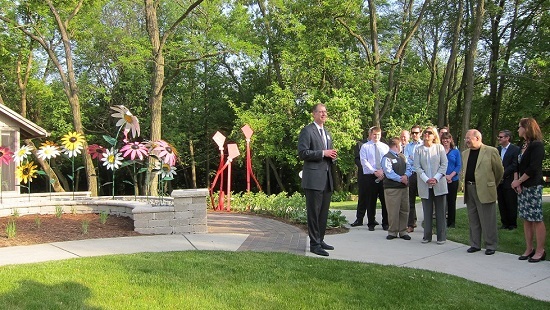 Outside the Naperville location of Almost Home Kids, a garden has been created for children, siblings, parents, guests, and volunteers. Visitors enjoy the soothing water fountain, figures of kites, flowers, and deer and find peace in nature surrounded by plants, flowers and trees. Read the full article at the Almost Home Kids Blog. Almost Home Kids provides transitional care and respite in a home-like setting to children with complicated health needs. Their training prepares families to care for their children at home. Almost Home Kids is a short-term community based pediatric healthcare facility that brings together Medical Professionals, Recreational Volunteers, Community Providers, Sponsors, Donors, Friends, Corporate and Civic Partners. Almost Home Kids is licensed by the Department of Public Health under the Alternative Healthcare Delivery Act and has a site in Naperville and in Chicago. For more information, visit www.almosthomekids.org or call (630) 271-9155.